With a stay at Suitehotel Posthoorn in Monnickendam, you'll be 6.8 mi (10.9 km) from Marker Museum and 11.5 mi (18.6 km) from Rijksmuseum. Featured amenities include complimentary wired Internet access, a business center, and dry cleaning/laundry services. Free self parking is available onsite. With a stay at Leidse Square Marnix Apartments in Amsterdam (Museum Quarter), you'll be a 3-minute walk from Leidseplein and 15 minutes by foot from Nes. Houseboat apartments - Canal Belt West area offers accommodations throughout the area in Amsterdam. Featured amenities include multilingual staff and laundry facilities. Truelove Antique and Guesthouse offers accommodations throughout the area in Amsterdam. Featured amenities include multilingual staff and luggage storage. With a stay at Shortstay Rotterdam Apartments, you'll be centrally located in Rotterdam, within a 10-minute drive of De Koopgoot and Blijdorp Zoo. With a stay at Het Hart van Weesp in Weesp, you'll be on a river, and 12.2 mi (19.6 km) from Nes and 6 mi (9.6 km) from Heineken Music Hall. 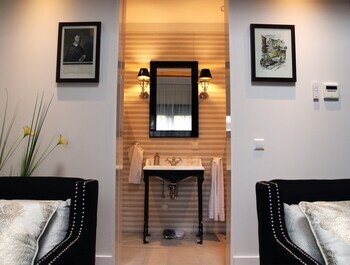 Located in Nuenen, Auberge Vincent is connected to a shopping center, within a 15-minute drive of Catharina Hospital and DAF Museum. Featured amenities include express check-in and luggage storage.